Front man Austin Getz doesn't blink when asked to sum up Turnover's third full-length, Good Nature. "Learning," he replies. "This whole record is about learning. Opening your eyes to new things, going outside of your comfort zone, and learning to grow into something new." Turnover's previous full-length, 2015's Peripheral Vision, won acclaim for showcasing a dreamier side of the band's melodically-charged sound; Billboard noted that "the quartet has morphed into a moody, atmospheric indie rock band, without losing its knack for hooks." As easy as it might have been to replicate that success for its third album, the band resisted the urge to play it safe. "It can be hard to be honest with yourself sometimes when it comes to creativity," Austin admits. Excited by the opportunities for personal and creative growth the band experienced in the wake of Peripheral Vision, they worked hard to strike a balance for its follow-up, "writing good songs but pushing boundaries, without getting strange just for the sake of being strange." As the range of textures, tempos, and dynamics on Good Nature hints, the members of Turnover have been listening to a wider range of musical styles over the past couple years. Vintage Southern soul and blues, Bossa nova and cool jazz, electronic music, and psychedelic grooves all filtered into the mix. "The new record definitely has a different rhythmic feel because of that," he observes. "The melodies we wrote for this record are very different, much less linear. They're much more soulful and move around a lot." Listening to how the leisurely "Nightlight Girl" melts into a more propulsive selection like "Breeze," and the way Good Nature flows together as a seamless whole, it's also evident that the foursome has been paying closer attention to how artists from earlier eras made full-length albums. "The Beach Boys' Pet Sounds has become one of my top five favorites of all time," says Austin, citing not only the quality of the individual selections, but also the careful sequencing and use of space in the arrangements. "I read a huge article on Frank Ocean toward the end of writing Good Nature, talking about taking his time on his records and being patient with the process, and that really inspired me, too." At the same time Austin and his cohorts were opening up their ears, they were opening up their understanding of themselves too: "A big chunk of the record is learning to be happy." Not full-throttle exuberance, but something much more subtle and satisfying. The almost beatific radiance that imbues Good Nature comes from a place of calm and contentment, nurtured by looking inward. "Peripheral Vision was mostly a record about feeling emptiness and not knowing what to do. This one is about the steps I took after feeling those things, and where those steps took me, and learning to try to love the emptiness." The album's unique blend of musical and spiritual growth is immediately audible on the opening track, "Super Natural," a late-summer idyll of intertwined guitar parts and laidback vocals. "More than anything else, love has the ability to teach people selflessness," says Austin. "That song is specifically about just one type of love, romantic love, and how it became almost meditative for me. It made me feel so relaxed, but at the same time I could feel it was something so big … it's 'super natural' and it's 'supernatural.'" From the flora and fauna that adorn its cover, to song titles like "Butterfly Dream" and "Sunshine Type," the natural world also plays a pivotal role in Turnover's latest. "Nature is a huge theme, because nature has been the teacher in my life when it comes to many things." To record Good Nature, Turnover reunited with longtime producer Will Yip. Together, they spent more time in the studio than on any previous Turnover record, devoting hours of pre-production to methodically going through the new songs, fine-tuning parts and writing additional melodies. The bulk of the lyrics, however, were finalized during the band's 2016 European tour. "That was a beautiful atmosphere to be doing it in – and the most intense experience I've ever had as a writer." Turnover formed in 2009 in Virginia Beach, VA and has gone on to tour extensively throughout North America, Europe, Australia, and Japan. Their discography includes three full-length albums and countless EPs and split-singles, including last year's Humblest Pleasures EP. "It's really cool to see all the change, from the first songs we ever wrote, right up to Good Nature," concludes Austin. 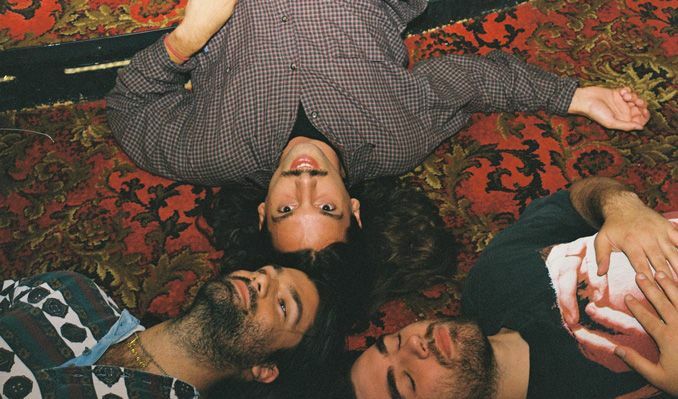 Eight years into their career, Turnover sound better than ever. Slip on your headphones, open up your ears, and learn for yourself what the excitement is all about.